Sentiments/Non-Humans: Mostly indifferent, sees most human-like D-bees as just another human, still can't help but stare at D-bees that are very different/alien. Sentiments/Coalition: Thinks of them as stuck up at best, no matter what his superiors and the government say. Disposition: Generally friendly sort of fellow, hangs out with the rest of the squad when off duty. On-duty he takes his job seriously, though he is not the by-the-book sort and will bend or out-right break the rules if the situation calls for it. Description: Athletic, wiry build, green eyes, black hair that is long on the top and pulled back into a warriors knot and shaved on the sides, also has a fair number of tattoos across his back, chest, & arms. These tattoos are a collage of power armor suits and robot vehicles from every manufacturer that sells these types of units in North America with steam-punk designs tying the individual pieces together. Max. Carrying Weight: 250 lbs. Max. Lifting Weight: 500 lbs. Triple Damage against Robots when a "natural," unmodified 18, 19 or 20 is rolled on an Aimed Shot. This applies only to robots and not power armor exoskeletons. armor, vehicles and robot vehicles by 5%. Spiritual and Determined: +2d4 to M.E. Spiritual and Determined: Inner Strength; has additional P.P.E. and can use TW items. Agile and Dexterous: +2d4 to P.P. Agile and Dexterous: Ambidextrous trait; Can use both the right and left hand with equal skill and dexterity; Paired Weapons skill is automatic. +1 APM, +10% to Climbing skills, +5% to Pick Locks, Pick Pockets, Palming, and Concealment skills. Cannot be surprised, even from behind. W.P. - Sharpshooting: Handgun; +1 attack per melee, Aimed: +3 strike, Called: +5 strike, Quick Draw: +4 initiative, Trick Shooting: Dodge, roll, or somersault and come up shooting, these are in addition to W.P. - Handgun bonuses. Last edited by Victor Singer on Mon Oct 22, 2018 3:16 pm, edited 66 times in total. 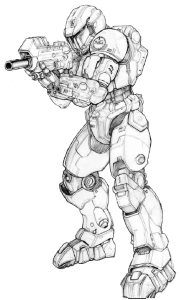 NG-X67 "Prophet" Infantry Power Armor - "Milashka"
* -4 to strike on a called shot, and must be a Called shot. ** Depleting the Main Body of MDC will shut the suit down. *** Force field regenerates at a rate of 1 MDC/melee round. Cat-like landings from heights: up to 200' without damage. Criminal I.D. Recognition System; Is programmed with 250,000 known criminals, wanted fugitives, Black Marketeers, terrorists, enemies of the state, bounties, identifying markings, known gang emblems, symbols, emblems, patches, & colors. Advanced Camera; this is mounted in the helmet has and has superior telescopic zoom (Range: 2 miles) and a macro-lens (x12 magnification), it can take stills & video (96 hours & 8,000 images), and it can be transmitted live (Range: 5 miles). Digital Dash-Cams (8); two in the helmet, 2 in the chest, 1 in each forearm, 2 in the back w 48 hours of record time & can take 4,000 stills. Peekaboo Cameras (2); located behind the left & right shoulders, can be used to peak around corners or through foliage without exposing oneself. Special & Standard Helmet Optics; Passive night-vision, Thermal imaging, IR, UV, black-light, laser distancer, IR light, & voice modulation (20 variations). Warning System & Multi-Cameras; Tied into the cameras & sensor array is a motion detection warning system that gives an audible voice warning/notification when the system picks up or spots something notable within 100'. This includes not only incoming fire or danger, direction, distance, but also subjects picked up by the Criminal I.D. System meaning it will give information about said subject as well, at least info it has in its files. This is basic info like name, race, friendly/hostile, or gang/group affiliation. Note: Used, has only 65 MDC, -5% Prowl (only to prowl, other movement is fine). A skilled operator could repair the suit to bring it to full MDC, but it would take double normal time. The Prowl penalty can be removed by redoing the fabric lining of the suit. What Victor didn't notice is that the legs have some bad repair to the fabric lining, it crinkles and cracks as the wearer moves. What he did notice is that the suit has been outfitted with four concealed pockets. One on the back is useful for a medium or smaller handgun. Two are on the inside of thighs are are suitable for hiding papers or the like (such as maps). The third is on the inside of the chest, it's only accessible when the suit is off. It can hold a larger volume of flat stuff compared to the thighs. • Mega-Damage: 2d4 M.D. or 4d6 M.D. • Mega-Damage: 3d6 M.D. or 1d4x10 M.D. • Weapons: None built in. • Note: May overheat if used continuously for more than four hours (01-40%). Overheating will destroy the machine; should be allowed to cool for two hours after every two or three hours of continuous use. Note: Used, has only 28 MDC, gets only 750 miles per charge, 12 years old. Otherwise in great working order. It would take rebuilding the housing almost completely to get the MDC back. Installing a new battery would restore the range to 800 miles. The brain child of the KLS corporation, this rail gun design is a miniaturized version of the RG-14 Electromagnetic Mass Driver. 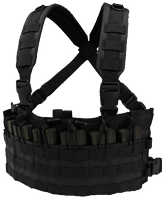 It's flexibility, efficiency, and relatively light weight make it the most potent man-portable, anti-armor & anti-demon weapon system ever produced. The only drawback is the delay in discharge as the capacitors spool up to release the hypersonic sabot payload. Several cases of these rifles have been released for field testing. Helical magazines must be custom made by highly skilled weapons shops and have a base cost of 1000 credits each. APDS rounds must be custom made by highly skilled weapons shops and have a base cost of 250 credits each. two sets of street clothes, pocket flashlight, tinted goggles, small digital photo album that has pictures of his family & friends, box of disposable plastic gloves (100 per box), three weeks of freeze-dried combat rations, duffle bag, air filter, 2-person tent, hunting & fishing kit, 30' of lightweight climbing rope, survival knife, small hatchet, short range radio, Hard-shell backpack from NG-X67. Damage: 5d6+3 or 3d4x10 M.D. Payload: 240 shots using a portable generator, which regenerates 8 shots per hour. Can also be directly linked to a vehicles power supply (Nuclear or Solid-Ox) giving it a virtually unlimited payload. Weight: Laser cannon - 40 lbs., Portable generator - 30 lbs. Last edited by Victor Singer on Mon Oct 22, 2018 3:40 pm, edited 47 times in total. Victor Calvin Singer was born to Robert and Karen Singer, he also has a sister named Christine who is just a year younger. His family lives in the Manistique Imperium where Victor was raised. His father works in a Northern Gun assembly plant that just so happens to turn out final assemblies of robot vehicles and power armor suits, interestingly enough his sister also works at the plant these days, though she began there after Victor left for the Army. From an early age he was fascinated by the robot vehicles and power armor that has dad built. Mainly it was the smaller power armor suits that caught his attention, how a soldier could go into combat in such a suit and take out a much larger, more heavily armored robot or a 20’ tall supernatural monster was exciting to him. So, when he turned 18 it seemed only natural that he join the Army and apply to be a PA pilot. With his reflexes plus his almost obsessive knowledge of power armor, he became an excellent soldier…at least on paper and tests. Somehow, during his 4 years of service, Victor was always assigned or re-assigned to a unit that was in the single most boring and inactive post. He has been in only 4 minor fire fights and even than his squad was either on mop-up duty or just on standby in case things went sideways. So, once his 4 years of enlistment was up, Victor applied for private military contractor status, purchased a Blue Boy power suit and moved on. He has done half a dozen solo jobs, but he’s found it is much more difficult to carry out a mission when you don’t have a squad at your back. This lead him to contact some old friends back home about any work they might know of. One friend in particular responded, Mindy Corsair. She in turn suggested he get hold of Emerald Ecks and after a long conversation about her brother Royal and his...life lessons...Emerald convinced Victor to reach out to Royal. Apparently her brother had for some time now been running a mercenary unit out of MercTown and she thought they might be hiring. Victor has misgivings about Royal, as he wasn't the nicest guy when they were kids, but Victor knows and trusts both Emerald and Mindy. In particular Mindy's word means most to him since she was not a fan of Royal when they were younger...now she seems to be genuinely proud of the guy. Victor figures it couldn't hurt to go and meet up with Royal and see what is what. So, he contacted Royal and the two set up a meet in MercTown. Now, looking at the city of MercTown from a nearby hilltop, Victor hopes his trek here means work...preferably paying work. Last edited by Victor Singer on Sat Jun 04, 2016 10:36 am, edited 6 times in total. Used T-42 Commando = 38,000 (pg. 38 of Triax & NGR) Note: Has only 45 MDC, -5% Prowl (only to prowl, other movement is fine). What Victor didn't notice is that the legs have some bad repair to the fabric lining, it crinkles and cracks as the wearer moves. What he did notice is that the suit has been outfitted with four concealed pockets. One on the back is useful for a medium or smaller handgun. Two are on the inside of thighs are are suitable for hiding papers or the like (such as maps). The third is on the inside of the chest, it's only accessible when the suit is off. It can hold a larger volume of flat stuff compared to the thighs. Used NG-WJ10 Speedpack (electric) = 28,000 (pg. 193 of Northern Gun 2) Note: Has only 28 MDC, gets only 750 miles per charge, 12 years old. Otherwise in great working order. It would take rebuilding the housing almost completely to get the MDC back. Installing a new battery would restore the range to 800 miles. Victor will look over several junkyards for this and will ask each of the owners to keep an eye out for the launcher or see if any of them will place an order for one, so to speak. None are available. Most of the dealers in Merctown are unfamiliar with the NGR military hardware. The Super Trooper is rare outside the military even in Europe. By the third junkyard the dealer tells Victor he got a call from Kraus telling him to not deal with Victor. 1d8 = 4: Receive a +2D6 Attribute Boost to P.S. (1) Receive a +2D4 Attribute Boost to M.E. +2d4 = 4 to M.E. +1d4 = 3x10=30 to P.P.E. NOTE: No point in rolling the sub table on the next two, since both are on the same sub-table and Victor already has 2 of the 4 on said sub-table. (1) Receive a +2D4 Attribute Boost to P.P.